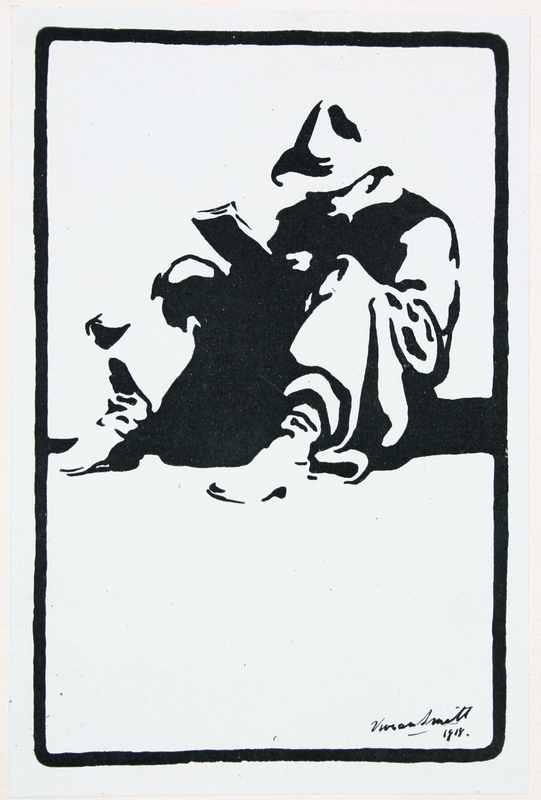 Vivian Smith, Untitled (Soldier Seated), 1918. From D J Guiney, ed., The Link (34th Reinforcements New Zealand Expeditionary Force, 1918). Ink on paper mounted on card. Collection of the Sarjeant Gallery Te Whare o Rehua Whanganui. Gift of Lilian Smith. Born in Sheffield, England, on 19 August 1883, Vivian trained at the Sheffield Technical School of Art and the Royal College of Art in London. In 1913 he emigrated to New Zealand, taking up a teaching position at the Wellington Technical College. His participation in the World War I effort began in October 1917 when he was called up for active service, joining the 34th Reinforcements of the New Zealand Expeditionary Force. After just over three months of training at Trentham military camp, he boarded the ship the HMT Ulimaroa bound for Europe. The company disembarked in Liverpool, and later travelled to France, marching into Étaples on 4 June. Two months later, Vivian was transferred to the 2nd Battalion of the West India Regiment and in early 1919 joined the 2nd Battalion of the Wellington Regiment. 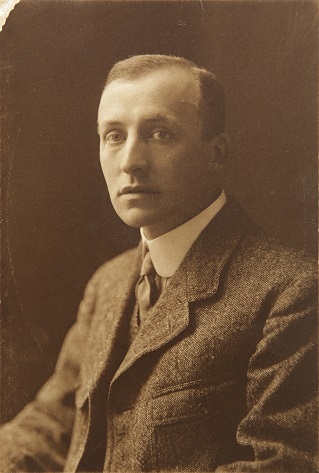 Following the conclusion of the war he returned to New Zealand, resuming his post at the Wellington Technical College in August 1919. An avid drawer, Vivian used this skill to capture some of the people and places that he encountered on this journey. Among the drawings that are today housed in the collection of the Sarjeant Gallery are some beautiful landscape studies of the village in which he was billeted during his first few months in France. Other drawings that he made show the men around him, some at rest, and others at work in the tunnels or on the battlefield. A striking characteristic of many of these works is their sense of intimacy. They are not glorifying or grand portrayals of war, nor do they focus on its shocking aspects. Instead they record local landscapes and fellow soldiers in quiet moments – a shady path through a forest, a neglected farm house, a man writing a letter, clothes hanging on a line – each drawn with Vivian’s keen eye for the often overlooked details of life. Also among the collection are copies of two journals, The Link and Homeward Bound to which Vivian contributed illustrations during the course of the war. Here his talent as a portraitist is amply demonstrated, with the journals collectively containing over 23 of his sketches of individual soldiers. Two block prints by the artist also appeared in The Link, including a wonderful depiction of a soldier engrossed in a magazine. In addition to Vivian’s war drawings, Where is Wisdom to be Found? showcases a selection of watercolours, drawings and prints created by Vivian and his wife Mary (née Green) over the course of their respective careers as artists and educators.